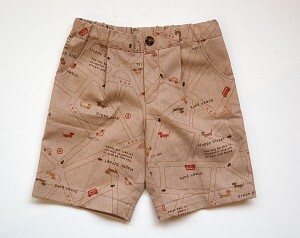 Many of you have requested a pattern for boy’s shorts. I wanted to give you something that would be easy enough for a beginner to sew but would look impressive. 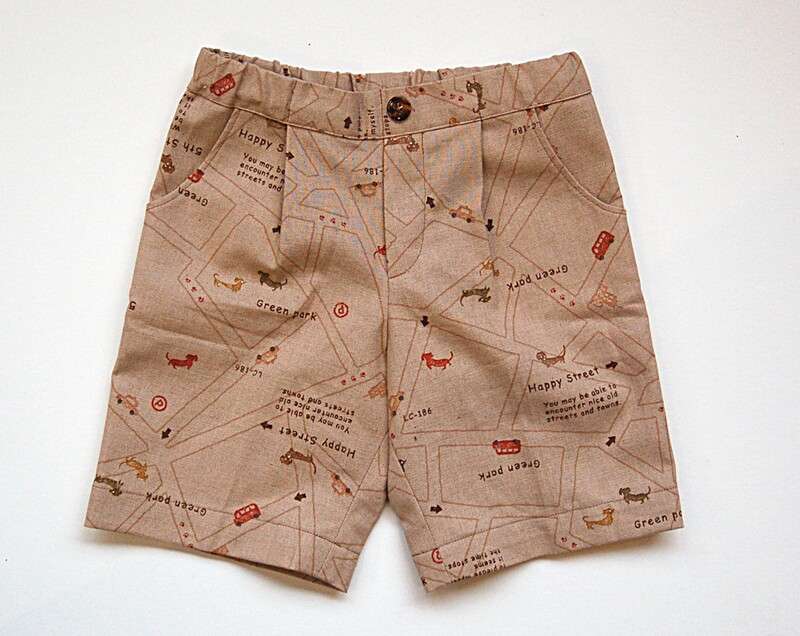 The shorts pattern included with the Sketchbook Shirt + Shorts has a simple elastic waistband that can also be sewn to look like a flat waistband in the front. The mock fly looks like a more challenging (and time-consuming) zipper fly but is actually very simple to stitch. And the pleats give it an easy fit while also allowing you to press a crease into the leg for a dressy look. 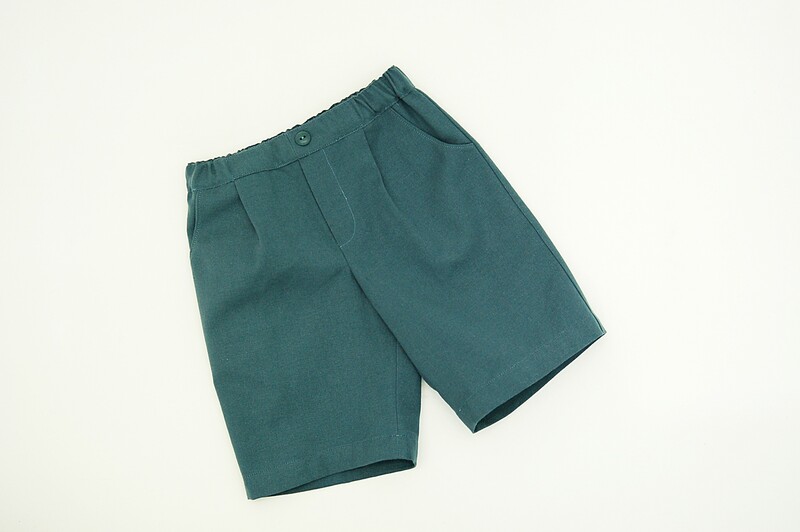 Boys will like the front pockets (you’ll like them too because they’re easy to make), and the below-the-knee length is appropriate for casual or dress occasions in warmer weather. This pattern is great for a beginners and would be rated one scissor if it were packaged by itself. So, like with the Music Class Blouse + Skirt, you could treat this pattern as a sewing class. Start with the shorts, move up to the short-sleeved shirt, and finish with the long-sleeved shirt to really develop your skills and sewing confidence. For the shorts we recommend light- to medium-weight woven fabrics like denim, canvas, chambray, corduroy, twill, and linen. That’s impressive!!! I am always wondering how do you do it!? Lovely as usual, these look great for casual or dressy and have wonderful details as usual. The boys will love the pockets. I will try to restrain myself and only buy the larger size pattern! Do you have bulk discounts for those of us with boys in both size ranges! ha! 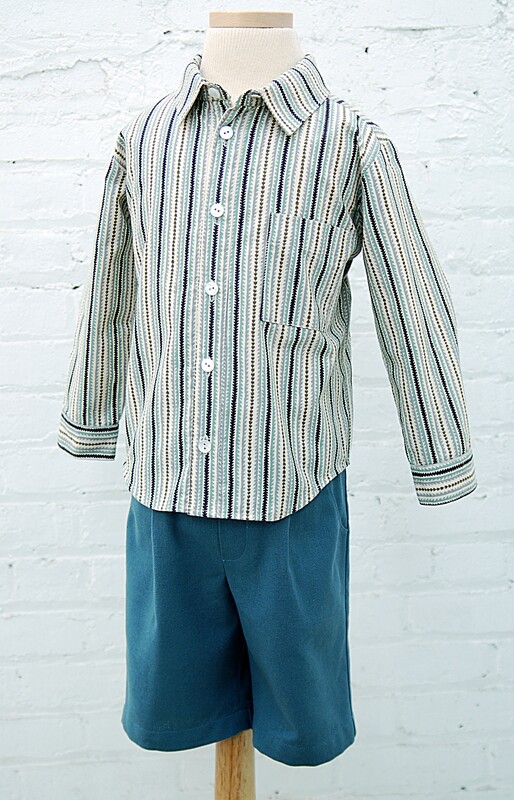 I will certainly purchase this pattern, I am sure I can lengthen the legs to make trousers and I may add belt carriers. I can not wait! I can’t wait for Monday!!!! Motherof5 – You should definitely be able to lengthen these. I lengthened the Sailboat pants (per instructions on the blog or forum – can’t remember which) and it worked beautifully! Thanks Mandy, I think they look great. Yay – nice looking elastic waist! My 3 3/4 son is not the most coordinated with buttons and zippers and only wants elastic waist. Unfortunately, the stores I shop for him only have really casual stuff (and often ugly IMO) elastic waist stuff – so this is perfect!